I always used to start the season in reasonable form and be competitive in my first races but over the last couple of years I seem to have lost the knack of this! Maybe it’s old age, maybe it’s just bad luck! Last year I threw myself off the bike just weeks before the season started and didn’t race until May. This year it is less serious, but still frustrating, as I have been unable to shake off a chest infection for several weeks! Still, as I had entered a 2-up time trial with Craig and was desperate not to let him down, I decided to start the race and hope for the best! I had ridden the Clayton Velo Spring Classic the week before and done OK but that evening and the following day, my illness had upped it’s game. I eventually conceded defeat and went to see the Doctor. I started a course of antibiotics just two days before the race. The day before the race there was heavy snow and some issues on local roads. For a fleeting moment I thought this may be sufficient to cancel the race but the snow melted as quickly as it had settled and, as the sun made an appearance the following day, my hopes were dashed! Craig and I decided to wrap up well. It had been a nice, sunny morning (I’d even shaved my legs in anticipation of displaying some flesh) but as we arrived at the Race HQ the sky looked decidedly dark and menacing, gone were the blue skies. As we warmed up for the race on our turbo trainers hail stone began to fall and it looked like being a grim afternoon of racing. Warming up on a turbo trainer in hail stones was a first for me! Fortunately, the hail had stopped when we made our start. Our ride to the start line had been timed with amazing precision, we landed there just as the team off before us were pushed off. I started on the front wondering whether this would be the one and only turn I’d be able to manage! The race start was deceptively tough, a long, uphill drag then a fairly steep climb with a few miles of rolling road to follow. My legs had felt empty right from the off but I managed to share the pace for this section. Then, as we turned onto the A34 to start the rolling run to the far point of the course, I felt the bit of strength I had in my legs waning, Craig had sensed this too! I had already told him about my illness and forewarned him about having to take longer turns and he duly obliged. Craig is on fine form and kept a great pace going over the next section of the course. I gave him some help where I could, just to try and give him some rest, but this help was short lived and fairly infrequent! The chequered flag approached and I came to the front to give one last big effort to the line. As we passed the time keeper Craig wondered whether the race was one lap or two as we had only done some 12 miles at that point. I didn’t have a clock on so was unaware of the distance we’d covered! We had passed teams with much lower numbers and it suddenly dawned on us that these were in fact on their 2nd lap! I had noticed these teams but had convinced myself that it was a one lap event and the organisers must have had some numbers missing from their set and substituted them for what they could find!! We realised we had to do another lap, which was a disaster for me in my condition! I continued on the front past the time keepers while absorbing the embarrassment of my ‘faux pas’ and then started to let Craig do some more big turns while I clung on and helped where I could! As the finish approached, and Craig tired, I was able to help a bit more with the pacing, and we reached the line in 57:59. We had no idea how that would compare with the other teams. Back at the HQ, and having assessed the result board, it was clear that the conditions had been tough for all concerned with just a handful of teams getting under the hour. We had come 3rd, just 2 seconds off 2nd place and some 49 seconds slower than the winning team, the Leigh Premier Duo of Nathan Turnbull and Chris Southworth, old teammates and friends of ours who I was pleased to see take the win given that Craig and I had been unable to. It was disappointing to have come so close to the win with Craig having to do so much of the work on his own and knowing that, if I’d been on form, we could have seriously challenged. We’ve vowed to compete for some more team time trial glory later in the year when, hopefully, we’ll have a full quota of fit and healthy riders! The Nova CC 2-up 25 is a well established and well run event. It has become a feature of the local, early season, time trial scene and I would like to thank the organisers and their helpers for their continued running of the event. 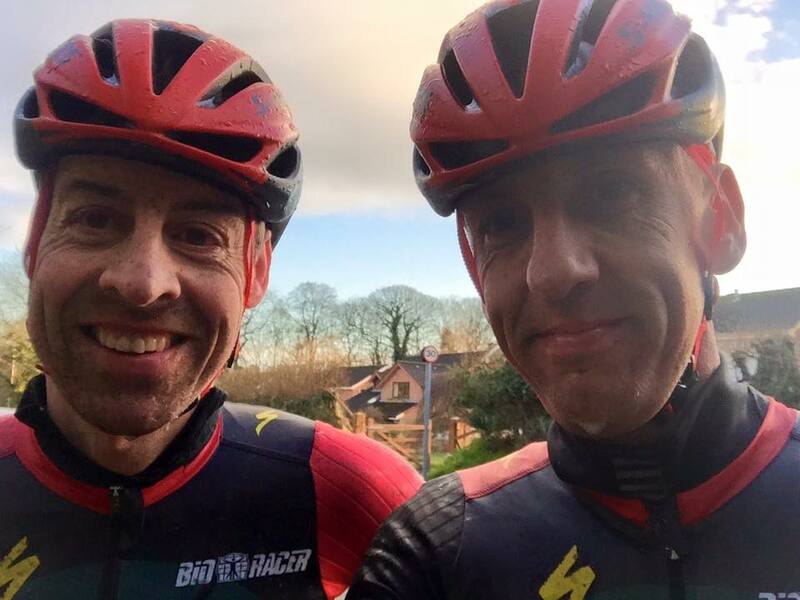 This entry was posted in Blogs and tagged Clayton Velo Spring Classic, Craig Battersby, Nova CC 2-up 25 mile Hilly Time Trial, Stephen Feeney. Bookmark the permalink.